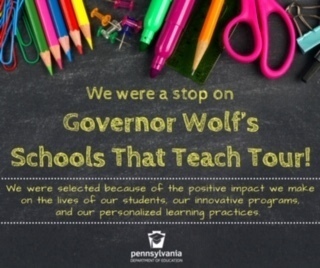 The Bedford Area School District was selected as a stop on Governor Wolf’s Schools That Teach Tour, bringing the Secretary of Education, Pedro Rivera, to Bedford High School and Bedford Middle School on Tuesday, January 22, 2019. The District was chosen as a stop for the Secretary of Education due to our successful After 3 Program. The after school program, which is funded entirely through 21st Century grant money, is for students in grades 6 through 12, and offers tutoring in math, English, and science, along with credit recovery and academic enrichment activities in career education; science, technology, engineering, and mathematics (STEM); nutrition; and drug and alcohol prevention. During his visit, Secretary Rivera met with school officials and students to discuss the challenges the district faces and highlight some of the district’s successes, including extracurricular activities. Rivera commented after his visit that one of the things he immediately noticed when speaking to Bedford Administrators and students was the collaborative effort and goals across multiple grade levels. Touring alongside Secretary Rivera was State Representative Jesse Topper, who credited the secretary for his efforts in visiting schools. Following their meeting with administrators and students at Bedford High School, they proceeded to the After 3 program, located at Bedford Middle School, meeting with the program coordinator, Mr. Patrick Neff, and students as a way to see the program in action. Mr. Neff is also the district’s Latin teacher at BHS.